Entre autres, seniority-based pay a Ã©tÃ© identifiÃ© comme l'un des facteurs qui ...... tech. 16.2. 13.5. 19.1. 18.6. 16.6 prof. 8.1. 7.7. 4.1. 8.7. 11.0 comv. 11.7. 15.2. 3. Stylised Facts of the State Labour Markets. 8. 4. Tests of Labour Mobility. 12 ... contribution that interstate migration has made to mitigating the employment ...... 5% and 10% levels respectively. Table A2: Johansen Test for Cointegration. H. 0. Feb 2, 2005 - t ) WtLr t + Tr t ; t t(Sr t + Hr t ). At+1. +. (1 ;!) ! Finally, aggregate consumption is obtained simply by summing up (2.20) and. (2.29), using f t+1. Ar. 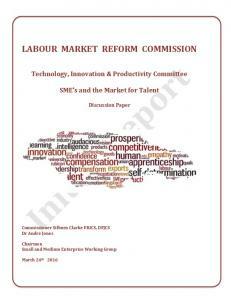 Keywords: Foreign Investment, Labour Market Regulation, Employment Policy, ...... For example, severe and protracted differences between management. wage bill. 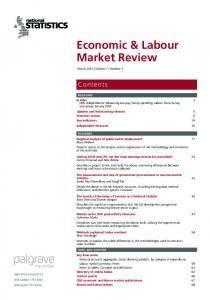 Section 6 analyses the flexibility provided to firms by the labour market reforms by focusing on firms’ perceptions about the effectiveness of reforms. A final section concludes. Since firms adjusted their labour input during the crisis, the sample also includes some firms with less than 20 employees. The sample does not include the financial sector. The final sample includes 402 firms and the response rate was 8%. The survey was conducted by email and the response rate is comparable to the response rate of countries conducting the survey by email or traditional mail (see Izquierdo et.al 2017). 10 As in the previous two waves, the countries conducting the survey used a harmonised questionnaire that contained a core set of questions asked in all countries and a set of non-core questions asked only in some of them. The harmonised design of the survey allows the creation of a cross-country data set that provides comparable information on firms’ adjustment during the crisis. generated there. The significant share of multi-establishment and exporting firms in our sample is consistent with the size distribution of our sample. Bigger firms are more likely to have premises in more than one location and are also more likely to be able to bear the initial sunk costs that are related to selling products in foreign markets. The survey covers firms that survived the crisis, at least until the end of 2014 and early 2015, the period the survey was conducted. Therefore, the current survey is likely to underestimate the overall impact of the economic downturn on firms’ activities as it is not able to account for firm closures. 12 The growth of bank credit to non-financial corporations declined from 4.3% year-on-year in January 2010 to -5% year-on-year in December 2013 (Source: Bank of Greece). relevant by half of the firms.13 Cost and quantity constraints relating to investment financing and debt refinancing are also important as they are considered to be relevant or very relevant by over 40% of firms. Constraints relating to working capital appear, however, to be slightly more binding compared to the other options. Concerning other shocks, 78% of firms report that they were negatively affected (strongly or moderately) by the volatility of demand and 61% that they were negatively affected by the availability of supplies from the usual suppliers. Interestingly, 85% of firms report a negative impact of the customers’ ability to pay. Customers’ ability to pay could be considered as a factor influencing firms’ liquidity. Considering that constraints in accessing external finance were also prevalent, the survey shows that financial pressures have had a negative impact on the activities of a significant share of firms during the survey reference period. There appear to be no significant differences of the impact of the various shocks across different sectors and size classes. Size and sector dummies are insignificant in a simple probit regression where the incidence of negative shocks is the dependent variable and size and sector dummies the independent variables (see Table A1 in the Appendix). It appears that since the shocks that hit Greece were so pervasive they influenced firms in all sectors alike. Interestingly, firms that are mainly foreign owned are less likely to have been negatively affected by credit constraints and the availability of supplies. Therefore, domestic credit conditions and the availability of supplies do not seem to constitute a significant problem for foreign firms that most probably rely on their parent companies for funding and supplies. Regarding the duration of shocks, firms were asked for each shock to indicate whether they considered it to be transitory, partly persistent or long-lasting. 71% of the firms reporting a negative impact of demand perceive that the shock to demand is partly persistent. The corresponding share is 74% for the volatility of demand, 71% for the access to external finance, 72% for the customer’s ability to pay and 59% for the availability of supplies from the usual suppliers. Therefore, the majority of firms reporting a negative impact of the shocks on their activity consider the shocks to be partly persistent. Firms were asked to rank each option in terms of relevance (1=Not relevant, 2= of little relevance, 3=Relevant, 4=Very relevant). Firms were asked to indicate whether their costs: 1= decreased strongly 2=decreased moderately 3=remained unchanged 4=increased moderately 5=increased strongly. prices seems to be consistent with the intensity of the demand shock and the decline in costs. In foreign markets, Greek firms did not experience, as noted in the previous section, a comparable decline in demand. The evolution of foreign prices is therefore consistent with the evolution of foreign demand. Further, Greece is a small country and may in some markets be a price-taker. Firms experiencing a demand shock are those reporting a (strong or moderate) negative impact of demand on their activities. Firms experiencing a demand shock and financial constraints are those reporting a (strong or moderate) negative impact of demand and access to external finance on their activities. (moderately/strongly) by more than half of the firms is a freeze or reduction of new hires. A non-subsidised reduction of working hours, individual lay-offs, a reduction in the employment of agency workers and others and the non-renewal of temporary contracts were also used to a large extent by firms to adjust their labour input. By contrast, collective lay-offs and early retirement schemes were not used much.16 The question analysed in Table 5 focuses on the intensity of use of the various margins firms used to adjust labour input. Another question allows us to quantify the actual adjustment of employment and hours and to link the use of these margins to the adjustment of permanent and temporary employment as well as hours.17 Particularly, firms were asked to indicate how permanent and temporary employment, as well as hours, have evolved.18 The share of firms reporting a decrease (moderate or strong) in the employment of permanent workers is 47%; the share of firms reporting a decline in the employment of temporary workers is 23%; and the share of firms reporting a decline in hours per employee is 18%. Interestingly, smaller firms are less likely to reduce permanent or temporary employment (Table A3 in the Appendix). In smaller firms employees and employers interact closely and have personal relationships and therefore lay-offs may be avoided if other alternatives exist. Furthermore, firms in the trade and business services sectors are less likely to have reduced hours compared to manufacturing. Shift work is more prevalent in manufacturing and this is probably the reason why manufacturing firms were more likely to reduce hours. There is a higher intensity of use of most measures of labour input adjustment across firms experiencing a demand shock or a demand shock and financial constraints. The ranking of measures, however, in terms of intensity of use does not change. 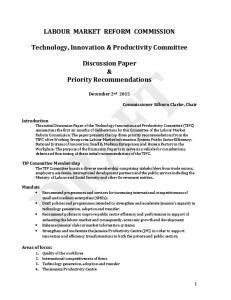 17 The question on the evolution of permanent employment, temporary employment and hours is asked independently and is not directly linked to the question analysed in Table 5. 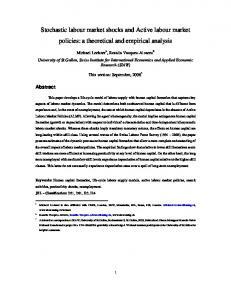 The joint analysis of both questions could however provide an indication of the impact of the use of these margins on the actual evolution of employment and hours. 18 They were asked to indicate whether temporary, permanent employment and hours have: 1=decreased strongly, 2=decreased moderately, 3=remained unchanged, 4=increased moderately, 5=increased strongly. 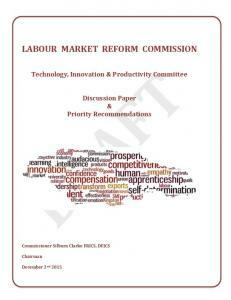 Therefore, during the period under investigation, more than half of the firms surveyed needed to adjust their labour input or change its composition. Firms used a combination of measures in order to make the necessary adjustments and these led to a decrease in both permanent and temporary employment as well as a reduction in hours per employee. Employment adjustment seems however to have been higher than hours adjustment. faced with shocks, adjusted the wage bill by using other measures of labour cost adjustment such as pay and non-pay benefits, promotion freezes, etc. (see Babecky et.al. 2012). The rarity of wage cuts is well documented in the literature and is attributed mainly to concerns about the retention of productive staff and the impact of wage cuts on workers’ effort and moral (see Bewly 1995 and Camplel and Kamlani 1997). However, during 2010-2013 the intensity and duration of shocks were strong and extended. As noted in the previous section, 71% of Greek firms reported that the evolution of demand had a negative impact on their activities. It remains interesting therefore to examine whether during the recent recession Greek firms adjusted their wage bill by a downward adjustment of wages. The WDN3 survey allows us to investigate this question as it asked firms to indicate whether they froze and/or cut base wages in each of the years 2010, 2011, 2012 and 2013. As Table 6 shows, 63% of firms indicated that they kept wages constant at least once in the period 2010-2013. As regards the timing of wage freezes, 51% of firms indicated that they froze wages in 2010, 46% in 2011, 42% in 2012 and 43% in 2013. Concerning wage cuts, 55% of firms stated that they cut wages at least once.19 As to the timing, the share of firms cutting wages was low in the initial phase of the crisis, 8% in 2010, and gradually increased to 18% in 2011 and 35% in 2012, before falling to 28% in 2013. The timing is consistent with the time pattern of reforms. Most reforms that allowed firms to adjust labour costs took place in 2011-2012, i.e. the possibility for firm level agreements to undercut sectoral/occupational agreements, the suspension of the extension of occupational and sectoral collective agreements to non-signatory parties and the reduction in the minimum wage. The share of firms cutting wages is higher among firms experiencing a demand shock and firms experiencing a demand shock and credit constraints, i.e. 62% and 71% respectively. The fact that downward wage flexibility is associated with the labour market reforms implemented during the recent years is also confirmed by the probit regression results presented in Table A4 in the Appendix. For instance, firms applying firm level agreements are less likely to keep wages constant. By contrast, firms applying firm level agreements are more likely to cut wages.20 Interestingly, if one looks the at the timing of freezes and cuts, one observes that in the first years of the crisis the share of firms freezing wages was significantly higher than that of firms cutting wages. As the crisis progresses, the difference between the two shares is reduced. Of course, the timing of reforms is important. However, firms being aware of the negative impact of wage cuts on employees’ moral appear to have exhausted all alternatives before cutting wages. As unemployment increased and options for moving jobs decreased, employees may have become less reluctant to accept wage cuts if this were to secure their jobs. As mentioned earlier, prior to the crisis the adjustment of base and non-base wage components were substitutes. Firms did not cut wages but adjusted pay and non-pay benefits instead. During the current crisis, along with base wage cuts, Greek firms adjusted flexible wage components as well. Indeed, 51% of firms report a decline (moderate or strong) in flexible wage components.21 Therefore, in the current crisis in Greece the adjustment of base and non-base wage components were compliments and this is confirmed by the positive correlation of the variable measuring wage cuts and that measuring the decrease in flexible wage components (0.3280). 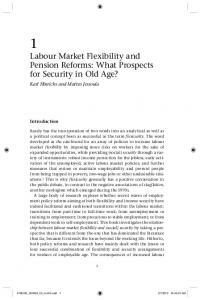 In conclusion, in Greece, during 2010-2013 there appear to be no rigidities regarding wage and labour input adjustment. A significant share of firms adjusted both. Labour input adjustment (hours and employment) was still the main adjustment channel in many EU countries but wage cuts appear to have been more frequently used in the EU in this recession. Yet, the share of firms adjusting wages in other countries is comparatively lower, i.e. 37% in Cyprus, 25% in Croatia, 23% in Ireland, 12% in Estonia, 16% in Latvia (see Izquierdo et. al 2017). Another interesting result that emerges from the regression analysis is that foreign owned firms are less likely to cut wages (Table A4 in the Appendix). This may be related to the skill mix of these firms as well their different wage policies. 21 Firms were asked to indicate whether flexible wage components have: 1=decreased strongly, 2= decreased moderately, 3= remained unchanged, 4=increased moderately, 5=increased strongly. payroll taxes and not the regulatory framework, which in any case has been significantly reformed in the recent period. Greece. The survey has allowed us to investigate how firms have adjusted to these shocks and, to what extent, according to their perceptions, labour market reforms have made it easier for them to adjust labour input and wages. The survey shows that the decline in economic activity, during the period 2010-2013, had a significant negative impact on firms’ activity. 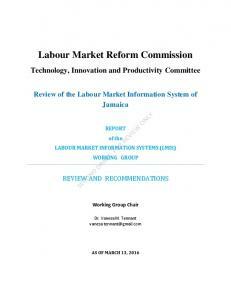 Firms reacted to the shocks by adjusting both labour input and the wage bill. Interestingly, the share of firms adjusting wages in Greece is the highest among the countries participating in the WDN3 survey. Furthermore, reforms seem to have made it easier for firms to adjust to shocks. A significant number of firms report that it was easier for them to adjust labour input and wages in 2013 compared to 2010. 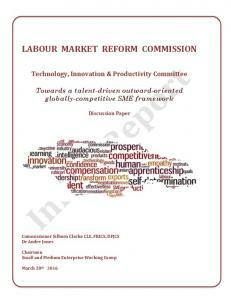 Firms attribute this flexibility mainly to the reform of labour laws. Regarding remaining inflexibilities in the Greek labour market and other obstacles that could influence the hiring of new employees with contracts of indefinite length, the survey shows that Greek firms consider economic uncertainty to be the most binding obstacle to hiring. By contrast, the regulatory framework, which has been significantly reformed in the recent period, is not frequently considered a relevant obstacle to hiring employees. References Babecký, J., Du Caju, P., Kosma, T., Lawless, M., Messina, J. and Rõõm, T, (2010), “Downward Nominal and Real Wage Rigidity: Survey Evidence from European Firms”, Bank of Greece, Working Paper, No. 110. 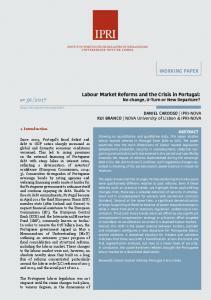 Babecký, J., Du Caju, P., Kosma, T., Lawless, M., Messina, J. and Rõõm, T. (2012), “How do European firms adjust their labour costs when nominal wages are rigid?”, Labour Economics, Vol. 19, No 5, pp. 792-801. Bank of Greece (2013), Annual Report 2012, Athens. Bank of Greece (2012), Monetary Policy -Interim Report 2012, Athens. Bank of Greece (2012), Annual Report 2011, Athens. Bewley, T. F. (1995), “A depressed labour market as explained by participants”, American Economic Review, Vol 85, No. 2 pp 250–54. Campbell, C. M., and. Kamlani, K. S., (1997), “The reasons for wage rigidity: Evidence from a Survey of Firms”, Quarterly Journal of Economics, Vol. 112, No. 3, pp. 759–89. D’Amuri F., Fabiani S., Sabbatini R., Polcini R. T., Venditti F., Viviano E. and Zizza R., (2015), “Wages and Prices in Italy during the Crisis: the Firms’ Perspective”, Bank of Italy, Occasional Paper, No. 289. 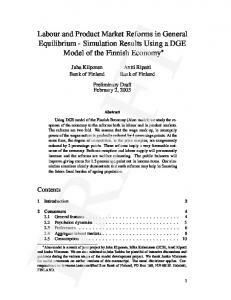 Fabiani, S., Galuscak, K., Kwapil, C., Lamo, A. and Rõõm, T., (2010), “Wage Rigidities and Labour Market Adjustment in Europe”, Journal of the European Economic Association, 8(23), pp. 497-505. 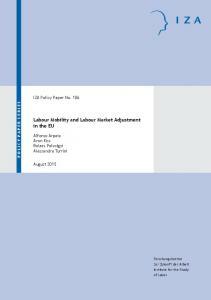 Fabiani, S., Lamo, A., Messina, J. and Rõõm, T., (2015), “European firm adjustment during times of economic crisis”, European Central Bank Working Paper, No. 1778. Izquierdo, M. and Jimeno J.F., (2015), “Employment, Wage and Price Reactions to the Crisis in Spain: Firm-Level Evidence from the WDN Survey”, Bank of Spain, Occasional Paper, No. 1503. 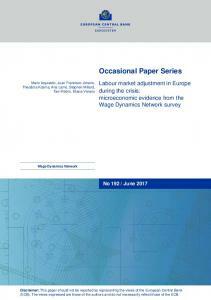 Izquierdo, M., Jimeno J.F., Kosma T., Lamo A., Millard S., Room T. and Viviano E., (2017), “Labour Market Adjustment during the Crisis: Microeconomic Evidence from the Wage Dynamics Network”, European Central Bank, Occasional Paper, forthcoming. Demand 40 31 4 17 8 Source: Third wave of the WDN survey - Sample of Greek firms Note: Figures are weighted to reflect overall employment and rescaled to exclude non-response The employment-adjusted weights account for the unequal probabilities of receiving and responding to the questionnaire across strata as well as for the average firm size (measured on the basis of number of employees) in the population in each stratum. For a brief description of how these weights are calculated see, Babecky et. al. (2010). 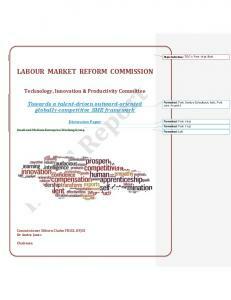 Report "Labour market adjustment and labour market reforms in Greece during ..."